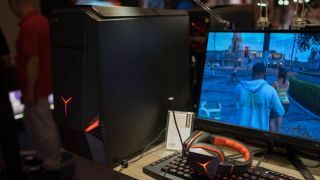 Along with refreshing its consumer desktops and laptops with Intel's new sixth generation Skylake processors, Lenovo is also giving its gaming systems a boost. Lenovo's game-centric PCs are branded under the IdeaCentre Y Series, and the gaming laptops fall under the IdeaPad Y Series. In addition to upgrading its hardware, Lenovo is also introducing new gaming peripherals. The company is rolling out a new mechanical keyboard, mouse and headset. As part of Lenovo's new re-branding, the higher the series number means the better the specs. As such, the Y900 is the flagship IdeaCentre gaming desktop in the series. Both the IdeaCentre Y900 ($1,599, £1,039, AU$2,246) and Y700 ($999, £649, AU$1,403) are highly serviceable and upgradeable machines, featuring a chassis large enough to fit a full ATX motherboard. Both models feature processor selection up to a quad-core Intel Core i7 Skylake, but the Y900 features support for dual graphics cards accessible via a push lever that opens a second compartment. The Y900 also comes with dust filters that helps the fans stay clean to keep the system cool. Designed for gaming on the go, Lenovo says that the IdeaPad Y700 ($949, £617, AU$1,333) is made with the mobility of a laptop and the power of Intel's and AMD's latest processors. Gamers will also get to configure the IdeaPad Y700 with dedicated graphics options. The system also features QHD screen options in 15- or 17-inch sizes. A touchscreen is optional, as is the Intel RealSense 3D camera. At IDF 2015, Intel showed that the RealSense camera can be used to scan the people and objects. This way, you can have a 3D avatar of yourself in your game, or you can replace common game elements and customize compatible games with objects that you scan in with the camera. For immersive audio, there is a JBL speaker and subwoofer. New accessories to the Y Series include the Y Gaming Surround Sound Headset ($69, £44, AU$96), Y Gaming Precision Mouse ($69, £44, AU$96), Y Gaming Mechanical Switch Keyboard ($139, £90, AU$195) and Y Gaming Backpack ($99, £64, AU$139). The headset delivers 7.1 virtual surround sound, features a quick mute button and in-line volume adjustment. There is also a noise canceling microphone. Lenovo says that the mouse has eight programmable buttons, four levels of adjustable DPI, five levels of adjustable weights and adjustable speeds all packed into an ergonomic package. Lenovo also sells a waterproof Y Gaming Mouse Mat ($9, £5, AU$12). The keyboard includes backlighting and anti-ghosting, comes with six customizable keys, five levels of brightness adjustments and a dedicated key for controlling the headset. The palm rest is detachable. The backpack is padded and can accommodate a 17.3-inch laptop. All accessories will be available in September. The IdeaCentre will arrive in November, while the IdeaPad laptop will arrive in October.